Beginning in 1900, the Waxahachie Chautauqua Summer Encampment and Assembly provided two weeks of education, culture, art, and recreation to the citizens of Waxahachie and to nearby cities, counties, and states. It attracted thousands of participants and hundreds of campers and became the center of social, religious, and economic life in Waxahachie. At 31 years, Waxahachie had by far the longest running Chautauqua in Texas. 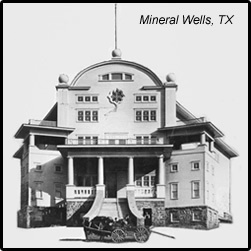 The Chautauqua movement spread to Texas in the 1880s, with Texas Chautauqua Assemblies established in San Marcos in 1885, Georgetown in 1889, followed by many others including Mineral Wells, Dallas, Paris, as well as Waxahachie. They frequently built ambitious and elaborate campgrounds, cottages, restaurants, auditoriums, classrooms, and other buildings. Despite this, no other Chautauqua building except Waxahachie’s Chautauqua Auditorium is still standing in Texas. The Chautauqua Movement originated at Lake Chautauqua, New York in 1874 as a summer retreat for the training of Sunday School teachers. It soon grew into an educational and cultural movement that included academics, music, art, humanities and physical education. Since many people could not travel to "Mother Chautauqua" in New York, numerous independent ("daughter") Chautauquas were established throughout the country based upon the ideal of the original. Some of these remain vibrant today. Additionally, in an effort to reach those who could not attend these Chautauqua, travelling circuits, or “tent Chautauquas,” sprang up around 1907 and continued until the 1930s.